**NOTE**: I always respond to inquiries within 24 Hours. If you're waiting for a response from me, please check your BULK or JUNK EMAIL folders. Emails can get trapped in these folders by your antivirus / antispyware software and I wouldn't want you to think that I wasn't getting back to you!!! Beautifully decorated / upgraded 740 square foot condo with heated pool and jacuzzi and great view of the beach in building that's directly on St. Pete Beach. Steps away from miles of white sandy beaches and plenty of water activity rentals. Newly renovated kitchen and bathrooms, 32 inch High Definition, Upgraded WIFI and TV Service with HBO® and Cinemax, DVD player, Stereo with CD player. Unlimited local and long distance calling in the U.S., Puerto Rico and Canada. New bar stools. Recently upgraded bedroom furniture including king size bed and box springs, dining table with 4 chairs, sofa bed, balcony furniture (4 chairs and small table). Our Non-Smoking condo is located on the 5th floor of a five-story building and includes magnificent views from the balcony of both the Gulf of Mexico and the Intercoastal Waterway. All rooms except for the two baths have a Gulf view! Fully stocked kitchen, new refrigerator and dishwasher. Extremely well maintained building built in 1990 situated on tropically landscaped grounds. Pool and hot tub area re-done in 2006, new gas BBQ grills in common area near pool. * Many shops, bars, restaurants along Gulf Blvd. * BayWalk in downtown St. Petersburg offers excellent dining, shopping, and entertainment. * Orlando with Disney World, EPCOT, and Sea World are just 90 minutes away. * Tampa airport is a 35 minute drive away. My wife and I both grew up near the ocean and we love to get back to ocean every chance that we get. For the past 6 years we've been vacationing in Florida. We've particularly enjoyed our time on St. Pete Beach. It's a great location for adults and kids alike. Lots of shops, restaurants and things to do if you get tired of lazy days on the beach and easy to get around. My kids 'live in the pool' when we're on vacation. Recently, we had an opportunity to buy this fantastic condo on the beach and we couldn't pass it up! This condo is a great example of 'location, location, location'. It's directly on the beach and close to everything. When we stay in on the beach, we typically split our time between the pool and the beach on the sunny days and plan day trips to Tampa to visit Busch Gardens or Adventure Island. Occasionally, when it rains, we'll visit the Tyrone Mall in St Petersburg or the Factory Outlets in Ellenton. Newly renovated countertops / sinks, clean bathrooms. 5th Floor Unit with nice view of the beach. NOTE: The condo building is directly on the beach. Our unit is on the 5th floor and has an excellent view of the beach and gulf from every room except the two full baths. Free local calls. Long distance restrictions apply. Linens provided. New Tommy Bahama bedspread. Apartment sized stacked washer / dryer. Unit comes with it's own parking spot, included in rate. Resort has free high speed wireless Internet included. 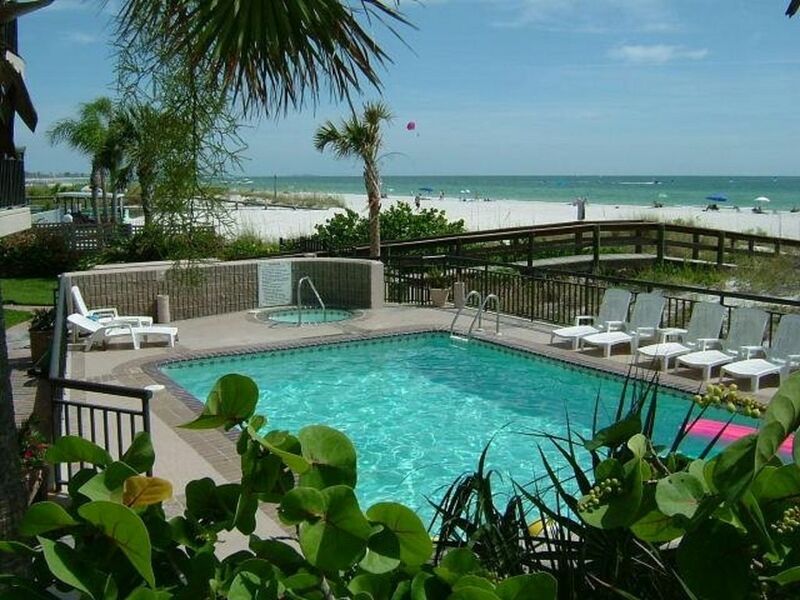 Condo Unit situated in resort on Saint Pete Beach. Elevator and Easy Access to Unit. Modern living room with beautiful view of the Gulf of Mexico / St Pete Beach. Brand new in March 2013. Freezer has a built in ice-maker. Brand new in December 2012. Kitchen is equipped with everything that you need for your stay. New Granite Countertops and sink / faucet in May 2012. Dining table seats four and there are 3 additional barstools around the granite countertop. New high definition 32 inch TV in Living Room and 27 inch TV in master bedroom. Overlooking St Pete Beach (Gulf of Mexico). Private to occupants of resort. Incredible pool, hot tub and barbeque area with sheltered seating area. Hot tub and pool area were refurbished in 2006. We thoroughly enjoyed staying at this condo on May 17-20. The condo is clean, modern, and only steps from the beach with an incredible view from the balcony. The amenities exceeded our expectations, and we never found ourselves searching for something that was not included. The king bed was very comfortable, and extra bedding was provided for the fold-out sofa. Hangers and an ironing board were included and much appreciated. As an added bonus, beach chairs and umbrellas were included. The only thing we needed to bring were beach towels - just as advertised. Overall, this was a great, quiet property, perfect for a relaxing beach vacation. The owners were responsive and clearly take great care of this beautiful property. The condo management was incredibly helpful and made our late check-in a breeze. We will certainly be back. Location , pool access, beach, shopping , food . Condo found to be clean and comfortable and well equipped. Would stay again . Very clean and great amenities. My wife and I spent a long weekend and we had a great time. The condo is in a great location, was very clean and had everything we needed. I would recommend staying here and we hope to come back. My friend and I had an excellent vacation. You can’t ask for a better location. The beach is literally just steps away. You’re also close to great restaurants and beach bars. We didn’t have a car and still felt everything was at our fingertips, just a short walk down the beach or boulevard. The condo was very clean and well equipped. My friend called it "her home away from home” and spoke about how comfortable it was. The owner was excellent and quick to respond to any inquiry. The onsite building manager was also very helpful. As for our favourite food and watering holes, we enjoyed MADFISH and Blue Fugu (a Japanese Steakhouse in Dolphin Village) for food and BONGOS for a beach bar and Level 11 for an evening cocktail with a great view of St. Pete Beach and area. For ice cream, check out the ice cream parlour in the Don Cesar – just remember to bring your shoes and a cover up if you’re walking up the beach! It was a great place to stay and I would certainly book through the same owner again. One helpful tip – if you arrive after hours and are to pick up your keys in the lock box, the lock box looks like what I would describe as an electrical box. It can be found outside the glass enclosure (where the elevator is) facing the pool/beach. Busch Gardens (Tampa), Adventure Island (Tampa), Factory Outlet Shopping (Ellenton). No resort fee and parking is included.